48TB-240TB: hot-swap drives high-performance dual 10Gbit hardware RAID controller's OS independent, in operation with: Linux, X, NetWare, OpenBSD, and Windows. The Nomadic 4U 88X storage provides a compact, affordable, expandable storage solution that's simple to deploy and easy to manage. Designed to support growing storage requirements, the high-density array scales to meet your business needs, and its building-block approach reduces costs and simplifies future upgrades to enterprise level NAS. The built-in controller's browser-based management tool simplifies the management of your NAS and is an ideal way to expand your storage needs. With dual 10Gbit iSCSI host interface per controller as well as Gbit connectivity for Firmware-embedded Web Browser-based RAID manager - Access your RAID subsystem from any standard internet browser via a Lan port. With exceptional data access, reliability, and the flexibility you will need as your storage grows from TB to PB, all this in a 4U rack space, with minimum power consumption, the Nomadic 88X offers an elite enterprise storage solution at an entry-level price. The array is easy to deploy with speeds of 10Gbit/s. It provides the fastest nondestructive erase processes, with multiple pass options when needed, flexible configuration and management options, online capacity expansion, and remote monitoring. A single GUI network interface provides common storage management across all arrays in the Nomadic 88X Family, reducing the number of elements you need to manage. In data intensive environments, increasing the capacity per disc drive lowers ownership costs by deploying fewer systems that use less cubic feet of space requiring less infrastructure such as cabinets, HBAs, and less wattage of power. 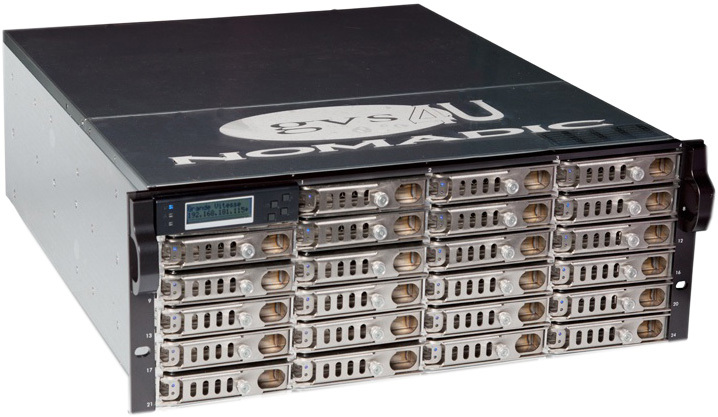 The Nomadic 88X uses SSD and spinning drive in a mixed data setting, allowing you to balance the cost and latency for your application hardware iSCSI off-load engine even using 7.2K RPM drive, high-capacity SATA or SAS disk drives and offers dual 10Gbit iSCSI host interface and dual eSAS expansion. You can use the Dual 10Gbit Channel ports to connect up to two servers in a redundant mode, in which case both server would be able to see all the drives at the same time, or direct attached to your network switch to share 10Gbit data to desktop. Users who have the need for extreme speed can reach over 10Gbits, with very high demand applications in a multiple user environment, virtually eliminating the complexity and cutting cost.